Route 71 (Main Street) in Avon, New Jersey received a facelift with the transformation of a four-lane highway with two travel lanes in each direction and parallel parking on both sides of the street to a two-lane roadway and an improved streetscape that accommodates pedestrians traveling from an adjoining residential neighborhood to the commercial Main Street. .67-mile long span of Route 71 through Avon's commercial center. The primary purpose of this project was to improve pedestrian safety for the significant number of residents crossing Main Street on a daily basis. In addition to increasing pedestrian and bicycle safety, the project also aesthetically enhanced the surrounding streetscape. The Borough of Avon decided to reduce speeds through the center of town by reducing the width of the roadway from four lanes to two travel lanes and constructing concrete bumpouts at each corner and constructing a center island. The safety of Route 71 was improved by providing dedicated left turning lanes and a bike lane. Also, the project included new paver sidewalks, street trees, decorative streetlights and street furniture such as planters, benches, trash receptacles and a borough clock. This "road diet" has contributed to the quality of life for the residents of the borough. 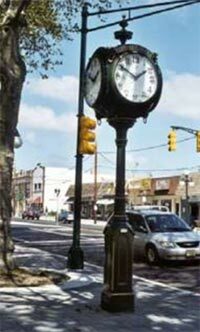 This signature clock symbolizes the revitalization of Main Street in Avon Borough accomplished by the plan. The transformed Main Street is a successful example of NJFIT and the project has been awarded the 2004 Good Neighbor Award from the New Jersey Business and Industry Association and the 2004 Streetscape Design Award from Downtown New Jersey as well as an honorable mention from the New Jersey Concrete and Aggregate Society.